Day 1 of the Trofeo Princesa Sofia Iberostar regatta plagued by lack of wind during the first part of the day but finally some racing has taken place. In the women’s 470, racing as one fleet, two races Britain’s Hannah Mills and Eilidh McIntyre (3,4) take the lead, four points ahead of Elena Berta and Bianca Caruso (6,5) of Italy. Third are Camille Lecointre and Aloise Retronaz (13,1) of France, and fourth Spain’s Silvia Depares and Patricia Cantero (1,14) tied with Ai Yoshida and Miho Yoshioka JPN. In the men’s 470, racing in two flights, after two races Jordi Xammer and Nicolas Rodriguez (1,2) of Spain lead. Second are Mat Belcher and Will Ryan (5,1) AUS, tied with Japan’s Keiju Okada and Jumpei Hokazono (1,5). Britain’s Luke Patience and Chris Grube (9,6) are 10th, Martin Wrigley and James Taylor (7,9) are 14th. The Finn after two races, sailing in two flights, leading is Alican Kayner (1,1) of Turkey, second Ed Wright (2,2) GBR and third Andrew Maloney (4,1) fourth Josh Junior (1,7) NZL. Giles Scott was 13th in his first race and won his second, he is 11th overall tied with 12th Nicholas Heiner 2,12) NED. 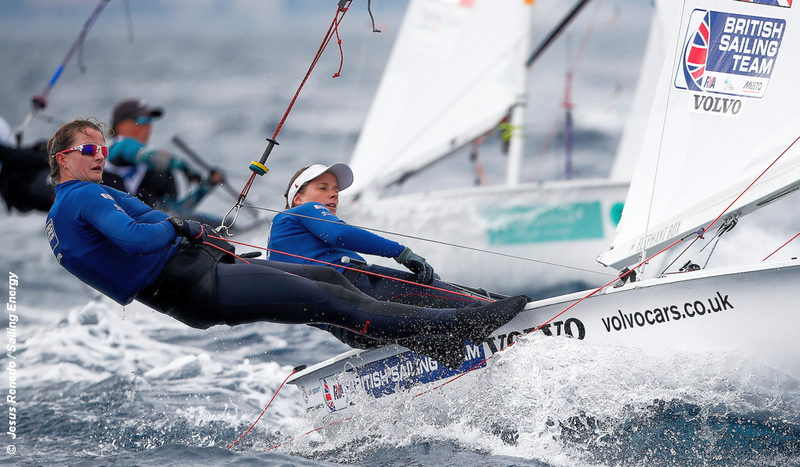 The women’s 49erFX series managed three qualifier races for their flights. Overall Australia’s Natasha Bryant and Annie Wilmot (1,2,3) lead tied on points with Britain’s Charlotte Dobson and Saskia Tidey (1,2,4), third are Brazil’s Martine Grael and Kahena Kunze (7,6,1). Fourth are Alexandra Maloney and Molly Meech (6,1,9) of New Zealand, with Britain’s Sophie Weguelin and Sophie Ainsworth (17,4,6) in tenth. The Laser managed one race for the three flights. Leaders are: Sergei Komissarkov RUS, Benjamin Vadnai HUN and Hermann Tomasgaard NOR. Best GBR is Nick Thompson in 13th then Lorenzo Chiavarini in 16th and Jack Wetherell in 22nd. In the Radial, racing in two flights, after two races the overall leader is Denmark’s Anne-Marie Rindom (1,1), second Dongshuang Zhang (2,6) of China and third Erika Reineke (6,3) of the USA. Not good for the Brits in the Radial where 25th was Hannah Snellgove (28,5), 26th Georgina Povall (25,9) and 54th Alison Young (35,15). The Nacra 17 managed three races for their two flights, overall Germany’s Paul Kohlhoff and Alica Stuhlemmer (3,1,1) lead by two points. Second are Gemma Jones and Jason Saunders (1,7,1) of New Zealand ansd in third place are Ruggero Tita and Caterina Banti (18,2,2) of Italy. Britain’s Ben Saxtona nd Nicola Boniface (5,3,5) are ninth, and John Gimson and Anna Burnet (16,4,5) are 11th. No racing for the 49er or RS:X Monday.